In Texas, our 52-week growing season has a double-edged sword: Yes, we can grow flowers in the garden all year round (well, the vote is still out on August). But if your plant choices are flats and flats of annuals—changed out by the season–you’ll either throw out your back or overdraw your checking account. Or both. Seldom in life can one say: unequivocally here’s the answer. With a vision of Oprah guiding my thoughts: Here Is The Answer: Practically Perfect Perennials. They bloom, come in every size, shape, and color of the color wheel, and make a return visit to your garden next season. Ideally, mix annuals (one season show) with perennials (several week bloom) for long lasting color. Gardeners’ hearty embrace of the charms of perennials has only come about in the last decade or so. I remember a Fort Worth nurseryman telling our class on perennials that he couldn’t give them away in the 1980s. Traffic stopping masses of white periwinkles were as ubiquitous as padded shoulders and Dynasty. As purchasing habits have moved from annuals to perennials, the look of gardens has also changed. Carefully chosen groupings of perennials tickle the senses with different bloom shapes, colors, and leaves in comparison with the banality of one type of annual. Enough already. I’m converted. I see the light. I want to add perennials to my garden beds. How do I start? Soil Prep: You can’t escape it in North Texas. Lots of compost, 3 inches of expanded shale, tilled in. Run a drip system or soaker hose up and down your beds. Plant, remembering the eventual height and width of the plant (tall goes in the back). Mulch like your plant’s life depends on it, at least 2-3 inches. What do I choose? I start with color. For example, for a house with brown brick you might consider going with warm, bright colors. Hot yellows, warm oranges, and flaming pinks pop against the neutral brown. Pick a unifying color; I almost always choose blue or purple. It goes with everything. Now life gets interesting. I use a yellow legal pad and some good gardening books. Make of list of plants you can’t live without. Like daylilies? Bee balm? Search for background perennials with high, mid-level, and low front of the bed plants. Think about bloom season to narrow your plant choices. Early spring? Early summer? Fall? To narrow your selections and make your garden more interesting, look at plants by bloom type. The four flower types are spike (salvia), tubular (petunia), ray (daisy), and umbel (lantana). You want to include each type of bloom. Also consider leaf shape and size. The huge leaf of a Mexican sunflower contrasts well with feathery yarrow or long and narrow salvia. 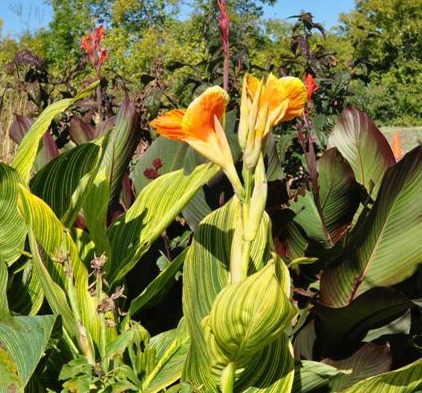 One of the selling points for cannas is their huge leaf, some varieties come now in shades of purple. For purple heart, the leaf is the big draw of the plant; the flower is small and insignificant. Stumped or overwhelmed? Don’t do it on your own. Go to the outstanding arboretums and botanical gardens in the area for ideas. Stroll the aisles of good nurseries and talk with the knowledgeable employees. Call the Dallas County Master Gardener Help Desk at 214/ 904-3053 for assistance. Oh, and have fun! For more soil prep garden advice review: One Way To Prepare A New Garden Bed. Posted in Perennials and tagged Dallas County Master Gardeners, Dallas Perennials. Bookmark the permalink. Very nice article, Elizabeth. I learn something new everytime, not only about plants but how to write an interesting article. Thanks!! !